Home > Vitamins & Food > Are Vitamins in Food Better Than Supplements? 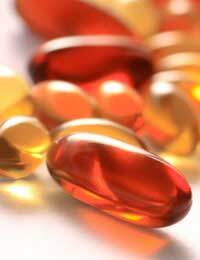 Vitamins are essential compounds that cannot be made by the body so must come from the diet. Vitamins are fat-soluble (vitamin A, vitamin D, vitamin E and vitamin K – see ‘What Are Fat Soluble Vitamins?’) or water-soluble (vitamin B and vitamin C). People should get enough vitamins from eating a balanced diet, including at least five portions of fruit and vegetables a day, eggs, dairy products (including low-fat versions), nuts and seeds, fish (especially oily fish) and healthy-sized portions of lean meat. Steaming, microwaving or pressure cooking vegetables will preserve more vitamins than boiling (see ‘Cooking to Preserve Vitamins’). Studies of large groups of people who ate diets high in fruit and vegetables over a number of years showed that they had a lower risk of heart disease and cancer, and this was assumed to be because of a higher intake of vitamins. However, studies of large groups of people taking vitamin supplements did not show similar lower rates of cancer and heart disease. This may be because the vitamins in the food are ‘better’ than the vitamins in the supplements, and are more effective because of the other components of the food, including phytochemicals and fibre. However, it may also mean that the people who ate a lot of fruit and vegetables also ate less meat, or were the kind of people who watched their diet and also exercised more. There are groups of people who might benefit from taking a supplement. These include pregnant and breastfeeding women, children, and people who are not eating a healthy diet, including those on very restricted diets because of allergies or intolerances, those on low and very low calorie diets, some elderly people, and some vegetarians and vegans. Other people who might benefit from supplements include people with long-term illnesses, people with diarrhoea or pancreatitis, people who drink or smoke heavily, and drug users. Certain vitamins can be useful in treating disease (see ‘Can Vitamins Prevent Disease?’) but this should be discussed with a doctor. What if I Eat Too Many Vitamins? If too many vitamins are eaten or taken, any fat-soluble vitamins that are not needed are stored in the liver, and any water-soluble vitamins that are not needed are generally taken out of the blood by the kidneys and got rid of in the urine. However, large amounts of some vitamins can be toxic – high doses of vitamin A can damage unborn babies, and can lead to nerve, liver, bone and skin disorders; high doses of vitamin B6 can cause nerve damage; and high doses of vitamin C may cause diarrhoea. Vitamin supplements can also make prescription and over the counter drugs either less effective, or more effective (which could lead to side effects) – see ‘How Drugs and Foods Interact with Vitamins’. Taking too many supplements can also waste a lot of money that would be better spent on good quality lean meat, oily fish, and fresh (or frozen) fruit and vegetables.